Despite all the new digital channels, social networks and message systems that have emerged over the past ten years, good old-fashioned B2B email marketing still remains one of the most effective ways of engaging with your buyers, attracting new prospects and retaining customers. As a marketing tool B2B email returns an excellent ROI – which is readily measurable – unlike many other marketing channels. It’s usage is still growing with an estimated 3 billion users worldwide by 2020. But like so many other things, it only works if it is done well. And with increasing competition within recipient’s inboxes, it increasingly needs to be done very well. With General Data Protection Regulation (GDPR) looming, compliance is also more important than ever. In this article we look at some essential tips to help you optimise your email marketing, and ensure you are compliant. An email that is not relevant to the reader. An email that is relevant but not useful. An email that is relevant, useful, but not readable. In fact any item of email that causes instant disappointment in the reader and is binned with malice. This has become more important recently however, because if users report your emails as spam – for whatever reason – it affects your reputation and may damage your ability to send emails if it happens too regularly. So avoiding being reported as spam should be a priority when planning campaigns and creating emails, and the percentage rate is an important metric to keep an eye on. Legislation has also been introduced in different countries. In the US it’s the CAN-SPAM Act, in Canada it’s CASL and in the UK it’s currently the fairly ineffectual Privacy and Electronic Communications (EC Directive) Regulations. However, that is about to change with the introduction of the General Data Protection Regulation (GDPR) next year. Consent under the GDPR must be a freely given, specific, informed and unambiguous indication of the individual’s wishes. There must be some form of clear affirmative action – or in other words, a positive opt-in – consent cannot be inferred from silence, pre-ticked boxes or inactivity. Consent must also be separate from other terms and conditions, and you will need to provide simple ways for people to withdraw consent. Another important change is that the burden of proof is upon you – you have to be able to prove that a person consented. If you have existing email data list, then this has to meet the current requirements of the GDPR – in other words it has to be opt-in, and it has to be documented. If it isn’t, then you will need to go back and get a GDPR compatible consent from each person on your list. The fines for not complying are now more significant than under the old legislation with a fine of up to €20 million, or 4% of your total worldwide annual turnover, whichever is higher, now possible. The Information Commissioner’s Office has a great deal of guidance on the legislation, which will come into force in May 2018. Remember, if you are sending emails overseas, then you will need to comply with relevant legislation in the country they are to be received in. Always make sure you have an unsubscribe link to a simple to use unsubscribe page. It may seem counter productive to make it easy for people to unsubscribe, but you want to target your resources at those people who are interested in your message, not waste everybody’s time spamming those who are not. One of the growing trends and most often suggested tip for improving engagement is to personalise emails. Here, I think we differ in culture from our transatlantic cousins where most of the statistics originate. I have a feeling that business people in the UK are slightly put off by overly friendly emails that are addressed to them personally. I would suggest that it rather than thinking of personalisation as using the recipient's name as often as you can, you think more of it as tailored content – sending messages and content that are relevant to that individual at that particular time. So once again we need to look to Buyer Personas for help with this. Past purchases – what products or services have they previously purchased, and what products or services are they likely to purchase next. The personal touch is also important in other ways – emails should always come from a real person, who can actually respond personally if necessary. Never forget that the most effective emails can be the one to one emails sales or support staff send and receive. When you are writing the email, imagine you are writing to one person – try not to remind the recipient that they are just one of many that you are sending the email to. People like to feel special, not part of the crowd. It is also crucial to get the tone of voice right, one that fits with the type of communication – promotional, transactional, informational or supportive, the target audience and your own company culture. sending emails which are triggered by some change in circumstance of the target audience. So which should you use? Well, the simple answer is that both have a role within email marketing. Email marketing automation is about sending a message at the right time. It involves sending out emails automatically according to defined parameters (or ‘triggers’), reducing the need for marketers to manually set the conditions for each and every email. These conditions can be anything from a particular time of day, to whether or not a user has interacted with a previous email campaign. These automated emails are often used as part of a workflow system that matches content and communications to the recipients stage in the buying cycle. 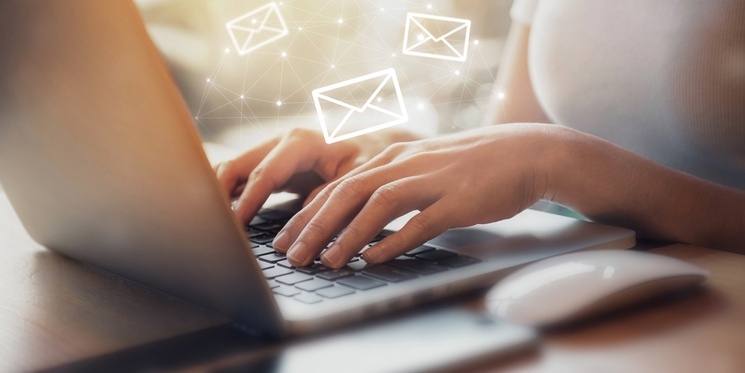 According to Epsilon Email Institute, emails that involve automation average a 70.5% higher open rate, while the click-through rate is also 152% higher than other emails. Typically, scheduled email newsletters are used to retain existing customers – providing them with useful information, tips, news and more. One of the key questions every email marketer asks about regular email newsletters is how frequently should I send email newsletters out? Once a month, once a week, once a month… or more? Well, this is largely dependent on the nature of the customers you are targeting (here you should reference your buyer personas again), the amount of knowledge or information they would find useful, and inevitably, the amount of resources you have available. What frequency works best for your subscribers can also be tested for, by taking a control group, starting off at one a month and slowly increasing the frequency. It’s also important to keep an eye on the reasons people give for unsubscribing – if “receiving too many emails” is a common complaint, reduce the frequency. You can also want to segment your list to separate out poor responders, so that you can reduce the frequency for that group. Finally, there is a relatively simply way of finding out what frequency people would prefer – give your subscribers the choice. Whereas the frequency of emails will depend on a number of factors as we have seen, we can be more clear cut about when to send them. A huge amount of research over the years has concluded that Tuesday, Wednesday and Thursday are the best days to send emails, with Tuesday being the most effective. For the time of day; 10am is seen as the peak time for opening emails. Remember that the majority of emails are received/opened up to an hour after sending, so it would be fine to send your emails at 9:30am for example. Remember though, that different groups may display different behaviours, so it is still good to run tests to determine the best opening times. Ultimately, you want people to engage with your emails, to respond to calls to action, so check that opening times correlate with click through times. It’s possible you may see better engagement results at less popular opening times. In a future article we will look at some other important factors that determine whether an email campaign is effective, but get the elements we’ve covered in this article right, and you should be well on the way to an effective B2B email campaign.